‘I’ve always wanted to give up painting, now I have a rational reason to do it. What am I waiting for?’ So writes Zofia Stryjenska, the once acclaimed artist, designer and illustrator during Poland’s interwar years, and yet largely forgotten during the country’s Communist period. The 34-year-old Stryjenska writes at the critical moment between choosing to stay with her children after the breakdown of her marriage, or leaving to fulfil a prestigious commission for the Exposition Internationale des Arts Décoratifs et Industriels Modernes in Paris, 1925. This extract from Stryjenska’s diary is contemporary artist Paulina Olowska’s preface to her own contribution of painting works in the current international setting: this year’s Berlin biennial, bb5. Setting up numerous knowing parallels between Stryjenska and herself, Olowska’s recent presentation of work, along with her curated show of Robert Jarosz’s Polish punk archive running concurrently in Berlin gallery MD72, is indicative of how her own practice has become increasingly pluralistic in its modes of production. Studying painting in both Gdansk and Chicago in the late 90s, Olowska has since refined her image-making and exhibition staging into an intriguing kind of open utopian form, which draws upon a varied landscape of people, projects and mediums that encompass painting, collage, curating and installation. In her installation ‘Metamorphosis’, 2005, at Museum Abteiberg for instance, Olowska rebuilt the architecture of a mid-20th century New York hairdressing salon as a closed installation. The aesthetic pleasure of the fashionable social space was sealed behind its shop-front glass and presented as an exhibition display cabinet within the gallery. In spite of the multiple materials of her practice, however, there is still something affectionately painterly about the manner in which Olowska approaches the past, particularly in her current work. She argues painting, although not her exclusive medium, can be the most radical as it ‘has this great power that it can derive from history’. And, in her presentation of new paintings at bb5, Olowska’s approach extends to the use of past narratives as a tool through which to re-imagine the present. With Zofia Stryjenska, Olowska stages an impossible dialogue with the deceased in a celebratory fashion that reveals the contemporary artist’s sense of optimism towards image-making. But Stryjenska is by no means the first female cultural figure Olowska has drawn attention to. Previous historical characters punctuating the artist’s practice include 30s Parisian fashion designer Elsa Schiaparelli (in the exhibition Attention à la Peinture, 2007) where Olowska adopted Schiaparelli’s painterly designs. 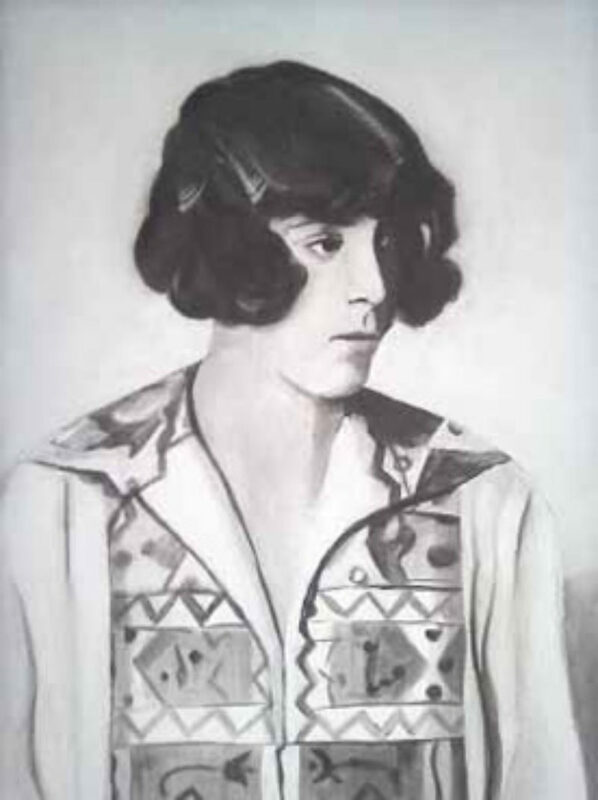 Elsewhere, Olowska has painted portraits of writers such as Vanessa Bell and Virginia Woolf, taken from Bridget Elliott and Jo-Ann Wallace’s book Women Artists and Writers – Modernist (Im)Positionings, as well as aligning her practice with that of British pop artist Pauline Boty in Hello to you too in 2006. Olowska’s collaborative practice also extends to her contemporary peers and she creates projects with the likes of Bonnie Camplin, Frances Stark and Lucy McKenzie—the latter most notoriously in the now legendary, raucous Nova Popularna bar in Warsaw, 2003. 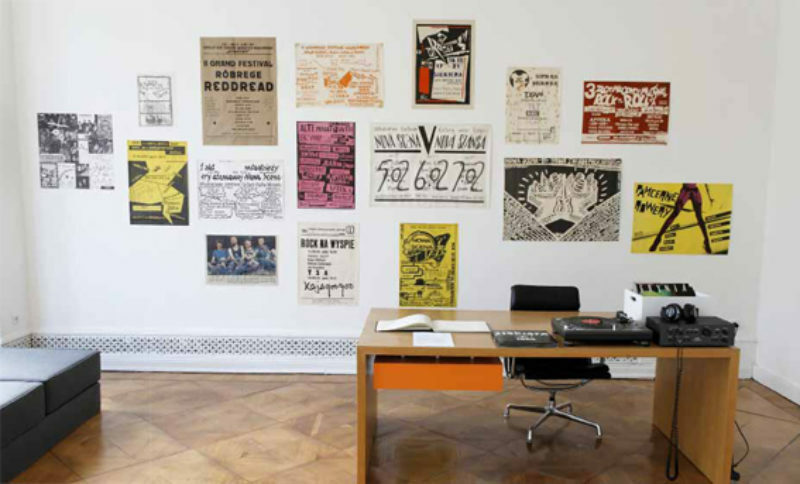 Her Polish punk archive, Neue Polinische Welle 1978-1986, 2008, meanwhile, recognises the distribution of art through social exchange—the provocative and often beautiful posters, cassettes and flyers emerge as the outpourings of energetically political youth. Olowska terms this kind of young exuberance as a ‘sense of improvised necessity’, a spontaneous utilitarianism that appropriated various aesthetics, both East and West; a tactic not so dissimilar to her own. And while she will also go on to present an archival selection of Zofia Stryjenska’s documents and objects in bb5’s Schinkel Pavillion in June, Olowska’s activities (particularly her presentations of collected objects) emerge as a short-hand for communication, both historical and present. Even in her painterly dialogues with figures such as Stryjenska, she punches through the purely aesthetic preoccupations of painting to promote a more social, collaborative form of art production. This is not to say that Olowska is disinterested in aesthetics, but rather aesthetics are the visual pleasure of collaboration, as well as a way to reanimate historical work. Allowing the aesthetics to lead rather than the politics (which is necessarily the social and historical context) of an artist like Stryjenska, for example, makes that work more recognisable to a contemporary gallery visitor in three different ways—it reactivates the work’s formal concerns, gives a temporal agency to the artist, and creates a different kind of access to the revisited artist previously unavailable through the material that existed before Olowska’s intervention. 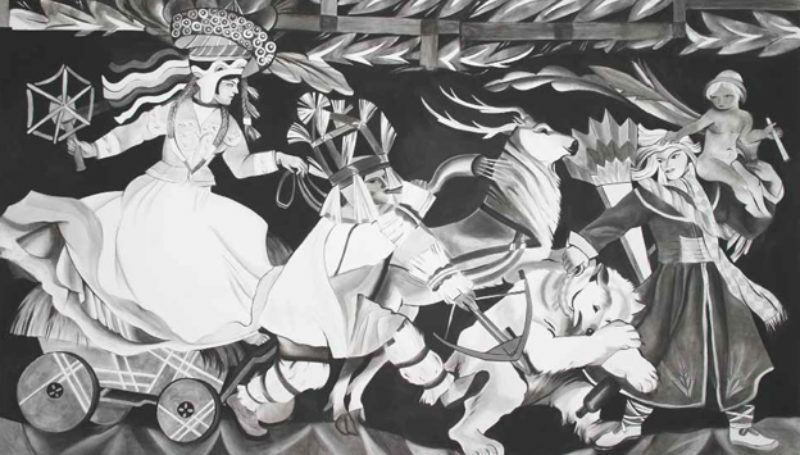 In Berlin’s Neue Nationalgalerie, Olowska presents a series of five large paintings copied from Stryjenska’s own work, including some of the panels Stryjenska finally decided to complete as part of her commission for the Exposition Internationale before returning home to her children. The result of extensive research, the new paintings are the same as their originals in almost every respect apart from the fact that they are devoid of colour. 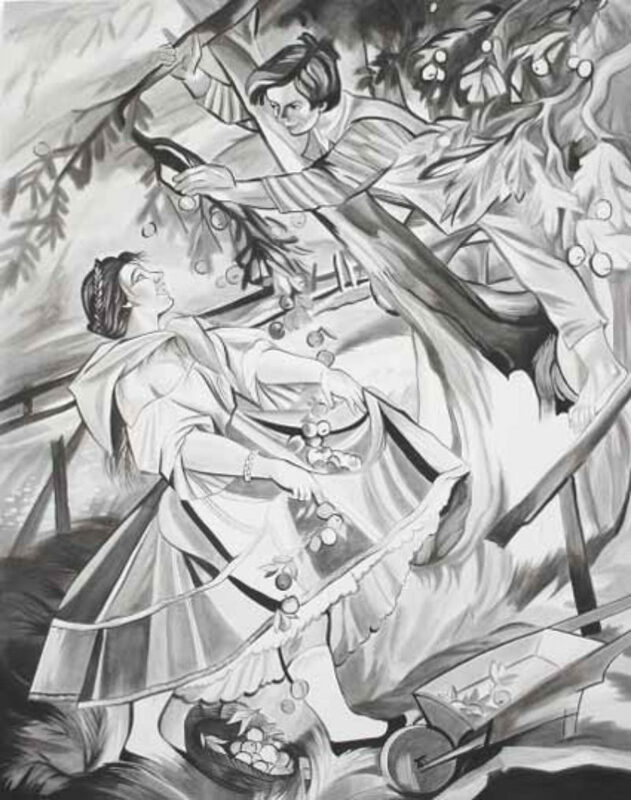 Copied from black and white photographic reproductions, Olowska situates her own work within an aesthetic interrogation and tactical re-presentation of Stryjenska. Her paintings strip Stryjenska’s of colour as if it were extraneous information, choosing instead to monochromatically focus on the spatial dynamism and fantastical characterisation of Stryjenska’s essentially folkloric allegory paintings. But, as Olowska points out herself ‘the outfits that Stryjenska paints, the situations and styles, they are made up’. Thus the anachronistic style of the original paintings was present at the time of their initial presentation, not only in retrospect. This revisitation of Stryjenska bears a characteristic intent that wavers between cheeky empathy and strategic reappropriation: two traits that are becoming tightly honed methods within Olowska’s celebratory and ambitiously varied oeuvre. ‘Her work has the same idea of weaving different backgrounds and styles as mine,’ Olowska states, adding that her desire to make the work is an eagerness to share it with her friends and peers. And although Olowska is returning to familiar territory in her address to past female icons, there is something intriguing about the timing of this particular project: a conscious boldness that tips into national interrogation, artistic reverence and decisive mirroring. It is worth pointing out that Stryjenska and Olowska are close in age at the time of their respective international presentations, and that the former died the same year Olowska was born. There is a generous kinship implicit in this restaging gesture that exceeds the mere excavation of another’s previous accomplishments. Olowska’s identification is also a strategy of active recuperation. It agitates against any glib notion of post-feminisms through its insistent highlighting of, and conversations with, historical female figures. By examining the past narratives of these women and their work, the artist’s manoeuvring ends up exposing the problematical way in which biology has been used to position females within a certain segment of modern art history. More importantly, Olowska’s appropriation reimagines history invested with a feminist future. As in the presentation of Stryjenska, the observer is pulled into a dream dialogue between two artists and, using the conceptual environment engineered by Olowska, asked to imagine the products of the fantasy collaboration and to reassess the work of both artists dialectically. Yet the Stryjenska series contains a gesture that stops just short of celebratory, as the small inclusion of Olowska’s beautifully minimal, loose painting of the late artist, neighbouring the five appropriated works, portrays Stryjenska looking over to the works in self-conscious pose and on the edge of self-doubt. The portrait stands in as a silent surrogate to watch over imagery that was destined for a different use than was originally intended, where Stryjenska’s motifs were often appropriated without credit or commission for state-produced objects. Olowska underlines the fact that producing art was a matter of financial survival for Stryjenska at times, as she became head of her family after separating from her husband. The reappropriation of the work signifies the recognition of a certain freedom too; there is a heightened awareness that ‘the artist’ can emancipate herself from the restraints of academic rigour, even the confines of a linear past, and so uses such a liberating and elastic position to reconceive history as an on-going creative endeavour. The role allows for a visual and conceptual reassessment of the silence and eventual decline of the deceased artist, and to create an intervention of Stryjenska’s practice in a reflexive and benevolent manner. This complexity of Olowska’s interaction with another artist is intriguing, particularly given her ceaseless enthusiasm for collaboration. Critic and art historian Boris Groys has argued the figure of the contemporary artist is no longer solely a producer of images, but instead occupies multiple roles as critic, analyst, reader and consumer of contemporary culture. Olowska’s practice appears to recognise the multifariousness of this stressed position, and yet dreams of an image not in terms of critical consumption, but rather as a site of generative potential: images that beget images. 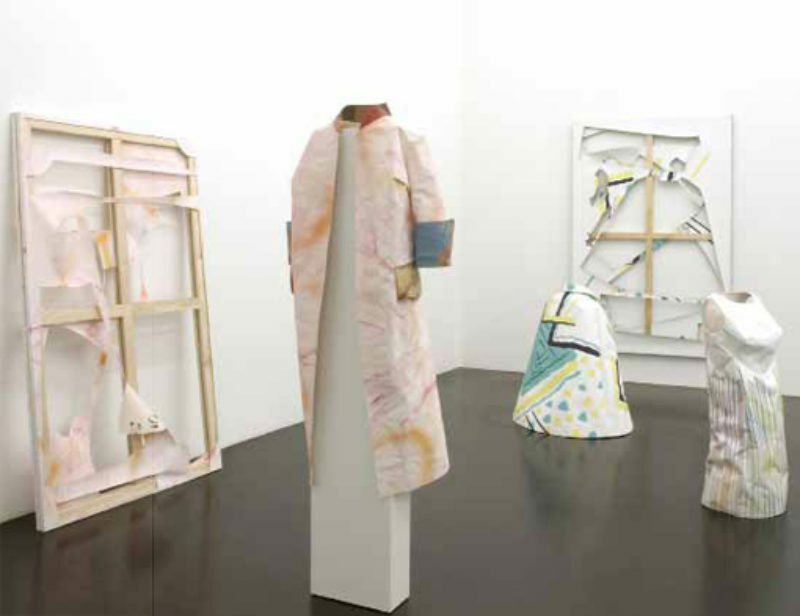 Roles are synthesised (as in ‘curating the painting’) or collapse into one another: Schiaparelli’s fashion designs are worked back into paintings, the canvases then cut out into clothes patterns to be reshaped as sculptural garments within the gallery, and Stryjenska’s most famous international presentation of work is replicated into another space and time. Indeed, the artist addresses images, people, and styles as a single yet expansive vocabulary, open to continuous reconfiguration in the quest to produce things constantly made current. There is more than a hint of avant-gardism about this, not least in the very styles she adopts: Bauhaus, Russian film posters, Cold War propaganda, to name only a few. But there is reflection and modification too. As art historian Lisa Tickner has stated, the game of the avant-garde is to alter the cultural field of possibilities, while the game of feminism is to make those changes ‘count’. Whether the recuperation of a female history of artistic production is Olowska’s attempt to make such games count or not, the artist retains a certain utopianism about such an endeavour. While confessessing she is ‘85% utopian’, Olowska admits the remaining 15% is left hanging in post-modern doubt. And it is this post-modern doubt that surfaces in unexpected ways, most notably through the back door of nostalgia. Nostalgic utopianism, in particular, is something that Olowska’s practice flirts with and interrogates in equal measure. Olowska’s various ‘returns’ to historical figures and outmoded aesthetics necessarily engage with the evocation of past periods and the extended memory of the collective for its potency. What makes Olowska’s move so interesting—and so rare within the contemporary art field—is the manner in which the work simultaneously displays and dismantles these tropes, or at the very least exposes them. The artist herself has spoken of the danger of nostalgia but recognises its ability to ‘underline the importance of a personal sense of history’. ‘It is a way to deal with a sense of longing for certain things from the past,’ says Olowska, who calls for a re-evaluation of nostalgic objects and ideas that once stood for utopic goals. Admittedly, to focus on the presence of nostalgia in Olowska’s work is not something new—the term features heavily in critical writing on Olowska’s practice, most often paired with the artist’s own life in Poland both during and in the aftermath of Communism. It would be remiss to skip over such facts, but it is nonetheless discouraging to see the imagination of the artist so firmly described as the product of her own biography. This outdated biographical reading of an artist’s work persists in art history, generally in the area reserved for female artists. There is a necessary distinction to make here, however, regarding Olowska’s own historical revisitation of the lives of creative women. The artist’s multiple practices produce a scatter effect, rather than nostalgic reminisence, in the conception of these female histories; Stryjenska, for instance, is revived through selective diary excerpts, objects, paintings, photos, painted portraits. The folkloric feel of her work is reanimated—the overall effect producing a different kind of narrative than is available in the historical rhetoric of biography. There is greater urgency, then, to frame Olowska’s own practice as a strategic interrogation, rather than as an accident of geography, into the apparent naïveté of nostalgia and the search for old utopias. Benjaminian scholar Susan Buck-Morss has confronted the positive properties of utopian longing in a refreshing, if not startling way, and her academic work is critically illuminating when read in reference to Olowska’s practice. In her essay ‘Dreamworlds and Catastrophe’, Buck-Morss insists that ‘the gap between utopian promise believed in by children and the dystopian actuality experienced by adults can generate a force for collective awakening.’ While one should regard the experiential criteria of ‘dystopian actuality’ with a degree of caution, the idea that the return to an old utopian promise, via an uncomfortable mix of nostalgia and disenchantment, can recuperate and provoke new desires, strikes at the heart of Olowska’s strategic approach to image-making. Olowska’s body of work argues the case for the radical potential of the recently outdated, as a kind of ‘rescue’ or rehabilitation of creative desires. By sorting through the remains of a previous century that attempted to seamlessly tie modernity, progress and technology together, she mines the utopian promises that lie therein. Her re-presentations trigger a youthful pleasure of the image, but they also retain knowing critical and temporal distance from the political fetishism of the original motives. Thus the ‘progressive’ in the propaganda source imagery used for Olowska’s ‘Nowa Scena’ painting and collage series, 2006, for example, is replaced by aesthetic relevancy. Her continous emphasis on aesthetics undermines the authority previously inscribed upon images most often appropriated in the service of propaganda. Her work instead seeks to reveal the ‘shape’ of art to which the politics most conveniently adhered to, during the period that art was first generated. While political art risks aestheticising of politics, Olowska invests a kind of abstraction that does not bury the attribution of her source images, but rather recognises the potential within them.